Will 2018 Be Target’s Best Year Ever? 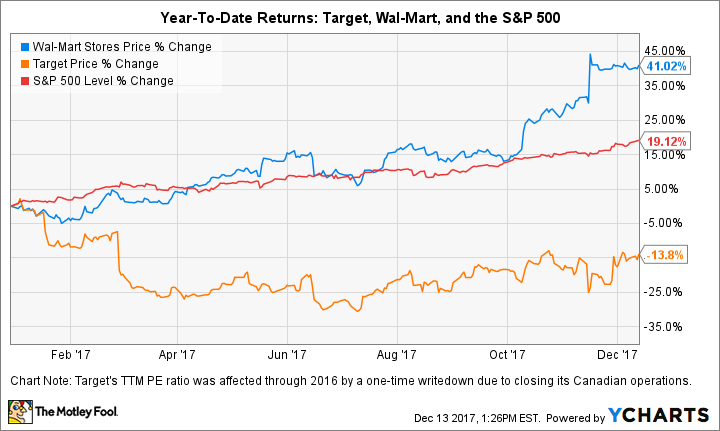 If Target can improve these two metrics, 2018 could be a strong year for investors. It's safe to assume 2017 is a year Target (NYSE:TGT) investors would rather forget. Shares of the retail commerce giant are down 14%, while the greater S&P 500 is up 19%. Even worse, the company's performance is nearly 55 percentage points below its biggest competitor, Wal-Mart (NYSE:WMT). In many ways, Target finds itself where Wal-Mart was in 2015. After years of lagging the market, Wal-Mart CEO Doug McMillon did something unusual in retail -- he ignored conventional wisdom and decided to invest in his company; Wal-Mart has doubled the S&P 500's return since that event and on a year-to-date basis. Can Target follow Wal-Mart's example to produce its best year ever? Here's what investors need to watch. Target's success hangs on two distinct, yet related numbers. The first is the company's comparable store (aka same-store) sales. For retail, there are two ways to increase your revenue: Build more locations or increase sales per location. In the long run, investors generally place more weight on comparable sales. Earlier this year, Target pledged to spend up to $7 billion to upgrade stores with a focus on improving the consumer experience. The upgrades were to focus on these initiatives: to align the digital and physical channels and remodel more than 1,000 stores. The combination of increased consumer spending and Target's initiatives have reversed falling comparable sales. I expect that to continue going forward. Data source: Target's quarterly SEC filings. The second figure Target investors should watch is the increase in comparable digital sales. While Target may appear to be doing well in this category, the company trails competitors. Target increased digital revenue in the third quarter by 24% year over year from a small base. Wal-Mart, on the other hand grew digital revenue by 50%. Amazon.com grew its global revenue from retail (ex-AWS) by 33% in its last quarterly report. Digital sales growth will become increasingly important for Target investors. In the recently reported third quarter, nearly all the contribution to comparable sales growth came from the digital channel. On a positive note, Target also has a long runway from growth as digital sales only comprise 4.3% of total sales. 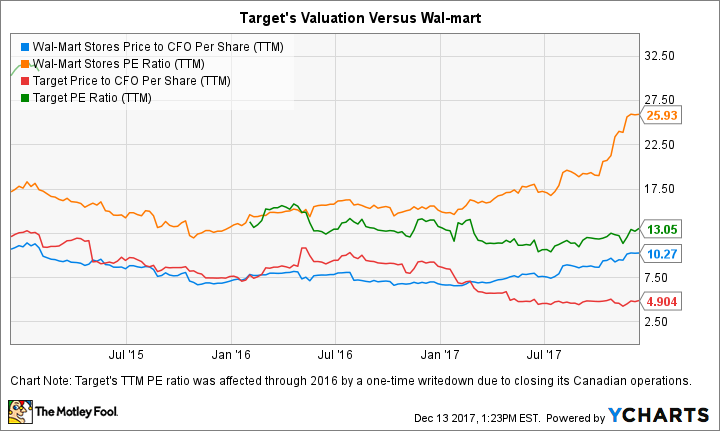 The best reason to buy Target shares is the company's current valuation. The company trades at a price-to-earnings ratio of 13 times and a price-to-cash flow ratio of five times. As the chart below shows, both figures are cheaper than Wal-Mart in 2015, before the company went on to double the market's return. Target is willing to pay you to wait, as its 4% dividend yield is more than double the S&P 500 aggregate yield of 1.8%. Investors can expect that to increase next year, and for many years afterward, as the company has increased its full-year dividend payout every year since 1971. If the company can follow Wal-Mart's example and grow digital revenue, the company should be handsomely rewarded from both increased earnings and expansion. With its stock valued so cheaply, next year could be the company's best year ever with moderately better execution.